By sending this booking your details will only be sent to Hoxton Square Bar and Kitchen and will never be shared with other third parties. By clicking this box you agree to the Terms and Conditions set out above. 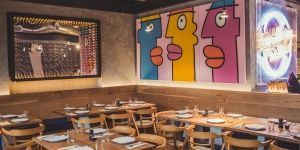 The flexible nature of this newly-decorated space means it can be moulded to deliver everything from a 3 course sit-down for 80 to a drinks and canapé party for 110. Evening hire generally starts from 5pm and goes on till midnight every Monday and 2am Tuesday - Thursdays.